Can I use UNCTADstat data in a publication? Yes. All data and metadata provided on UNCTADstat may be copied freely, duplicated and further distributed provided that they are not put up for sale or otherwise commercially exploited and that UNCTADstat is cited as the source. For any re-dissemination of UNCTADstat data and metadata for commercial use, please send the request in writing to the Secretary of the Publication Board (permissions@un.org). If I have a question, which is not covered in this section, who can I contact for assistance? You can send an e-mail to statistics@unctad.org with your requests or questions regarding UNCTADstat data. Should I register /pay in order to access your data? Access to data is free and there is no registration required. What can I find in the database? UNCTAD produces more than 150 indicators and statistical time series essential for the analysis of: International trade, economic trends, foreign direct investment, external financial resources, population and labor force, commodities, information economy, creative economy and maritime transport. How do I know which tables were recently released with new/revised data? The date of update/release is indicated, for each table, after the title of the table on the right side or via the RSS flow. I have noticed that sometimes figures corresponding to years already published have changed. Why is that? Because figures can be revised when our data providers update their figures retroactively or the compilation methodology has changed. Why do some data series start only in 1995? This applies to merchandise trade matrix and its related derived indicators. Around that year, there was a change in product classification (SITC Rev.2 into SITC Rev.3). What are your update schedules? Please visit our release calendar which provides a information on the schedule of release of data. All tables updates are grouped by month and can be filtered by quarter and statistical theme. When is the UNCTAD Handbook of Statistics released? Where can I find detailed data for FDI (by partner and sector)? Where can I find the data sources? The sources are cited in the Table Summary . Additional information and notes on particular tables can be found by clicking on in the table headings, dimensions or items. Where can I find the methodology used in the compilation of series or any other explanatory notes? The methodology is described in the summaries that can be opened by clicking on as well as other useful information regarding the data. What is an "economy" and what is a "partner"? In the exports and imports tables, the Economy refers to reporting entity and Partner refers to its trading country. Please note that exports and imports are asymmetrical (due to various limitations on the compilation methodology). Why is there a year added after some country names? In case of change in the statistical coverage of a country, it is identified by adding an end year after the country name. For example, Indonesia(…2002) indicates that the statistical coverage of Indonesia, including Timor-Leste, was valid until 2002. Where do I find the country groupings composition? The country groupings composition is available, in Excel and PDF format, in classifications. Why does the "Total word" not correspond to the sum of "Developing economies", "Transition economies" and "Developed economies"? World’ total represents the sum of the figures of the three above-mentioned groups plus the figures of a group of territories and partners not elsewhere classified, whose composition is detailed in classifications . Data of these territories are included in the world total if they have been reported but are not presented individually or in any group, either by geography, economy or trade. Where do I find the definition of products and product groups? The definition of products and the description of the product groupings are available, in EXCEL and PDF format, in classifications. Are the values in current or constant US dollars? Otherwise indicated, most data in dollars are expressed in current US dollars of the year to which they refer. Why does the sum of items not correspond to the total? Unless otherwise specified, country aggregates are the sums of the relevant country data by group. Calculations of aggregates may in some cases include data estimated by the UNCTAD secretariat that are not necessarily all reported separately. Furthermore because of rounding, details and percentages in tables do not necessarily add up to totals. Data were collected and checked to ensure that they matched the geographical coverage of the countries, as described below. However, some gaps could not be avoided due to data unavailability and are described in the table notes. How many years are concerned in the period 1985-1990? The use of a hyphen between years (e.g. 1985-1990) signifies the full period involved, including the initial and final years. How annual growth rates are calculated? Average annual growth rates are defined as the coefficient b in the exponential trend function y = aebt where t stands for time. This method takes all observations in a period into account. Therefore, the resulting growth rates reflect trends that are not unduly influenced by exceptional values. Why are exports and imports asymmetrical? Time of recording: It takes time to transport the goods. If the goods were shipped in December and arrived in January, the exports will be recorded in last year and imports will be in current year. Coverage, inclusion / exclusion of certain goods: Countries have different treatment on the inclusion and exclusion of goods (even though there is an international recommendation for this). Partner country attribution: The known exports destination at the time of exportations may be not where the goods go finally. The "famous" example is trade among Canada - USA - Mexico. The "final" destination of Mexican exports are sometimes unknown, so recording USA as destination, may be misleading, if the final destination is Canada (or vice-versa). However, Canada would record imports from Mexico as the country of origin. What does it mean that an economy imports from itself? From methodological point of view, it is possible that a country imports from itself, it is known as "re-imports" as explained in the Concepts & Definitions IMTS 2010 (See link above), page 30: 2.16. Reimports are imports of domestic goods which were previously recorded as exports. It is recommended that reimports not only be included in total imports but also be separately identified (coded) for analytical purposes. This may require the use of supplementary sources of information in order to determine that the goods in question are indeed reimports rather than (a) goods withdrawn after being temporarily dispatched without being previously recorded as exports, or (b) domestic goods that have acquired foreign origin through processing and which, therefore, should be recorded as imports of foreign goods under para. 2.15(a) above, but not identified as reimports. Why can FDI flows be negative? The amounts of FDI flows can be negative, as explained in the definition below: FDI inflows and outflows comprise capital provided (either directly or through other related enterprises) by a foreign direct investor to a FDI enterprise, or capital received by a foreign direct investor from a FDI enterprise. FDI includes the three following components: equity capital, reinvested earnings and intra-company loans. Equity capital is the foreign direct investor's purchase of shares of an enterprise in a country other than that of its residence. Reinvested earnings comprise the direct investor's share (in proportion to direct equity participation) of earnings not distributed as dividends by affiliates or earnings not remitted to the direct investor. Such retained profits by affiliates are reinvested. Intra-company loans or intra-company debt transactions refer to short- or long-term borrowing and lending of funds between direct investors (parent enterprises) and affiliate enterprises. Data on FDI flows are presented on net bases (capital transactions' credits less debits between direct investors and their foreign affiliates). Net decreases in assets or net increases in liabilities are recorded as credits (positive), while net increases in assets or net decreases in liabilities are recorded as debits (negative). Hence, FDI flows with a negative sign indicate that at least one of the three components of FDI is negative and not offset by positive amounts of the remaining components. These are called reverse investment or disinvestment. Where can I find documentation and help about your data browser? In UNCTADstat you can access a complete documentation about our web data server and also some tutorials. How can I save my own selection of economies, years, measure, in order to use it in different tables or later? Once you have made your own selection, choose 'Save current selections as profile' in the "Actions" list. You will be asked to register first and then to save the profile corresponding to your criteria. Then you will be able to use the profile that you have saved in different tables and whenever you may need it by activating it in the "Actions" list. Can I download the data in EXCEL or other formats? Yes. You can download the tables in EXCEL by clicking on . You can open the table and then save it or save it directly on your computer (Don't forget the limitations of EXCEL regarding the number of rows or columns). You can also download the tables in CSV format (text) or in the Beyond format . Why I cannot edit an excel file downloaded from UNCTADstat? It is due to strict default security policy in MS Excel 2010 and above when opening older version of Excel file. To be able to edit the file, you have to change the security policy first. When you open a MS Excel file downloaded from UNCTADstat or generated from a Beyond 20/20 table, it will open in Protected View by default and the editing functions will be disabled. At the top of the worksheet, you will see the 'Protected View' warning. The Info pane shows the file you downloaded from UNCTADstat is an MS Excel 3 Worksheet. 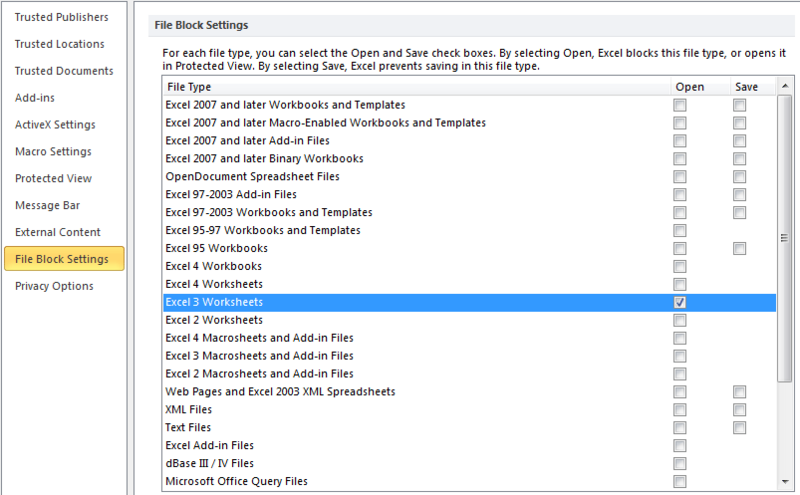 Uncheck 'Open' for the Excel 3 Worksheets file type, click OK and close your MS Excel file. Now you are able to edit the file. Why am I not able to directly open an Excel extraction without saving it first? It is due to strict default security policy in MS Excel 2010 (and above) when opening older version of Excel file. To be able to directly open this file, you have to change the security policy first. 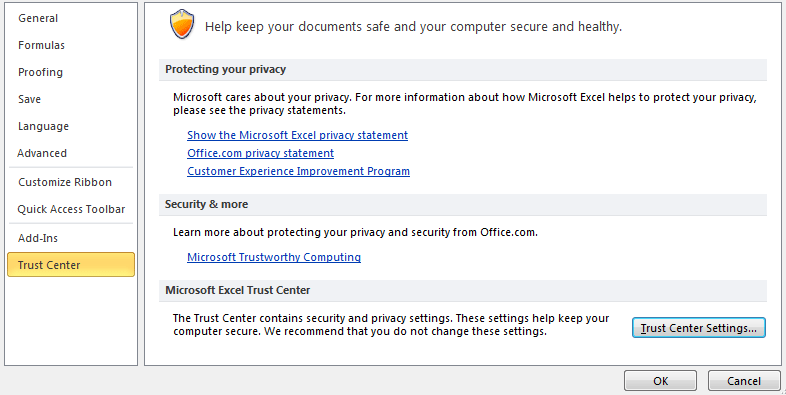 In Excel, click on "File", "Options"
Choose "Trust Center" and then "Trust Center Settings..."
Follow the 3rd step described above.